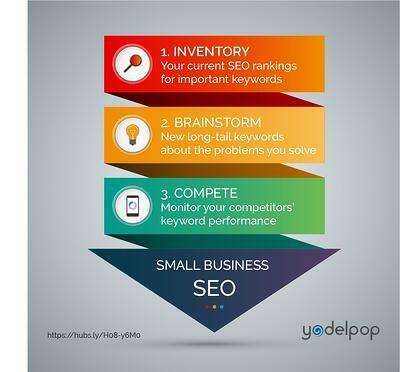 Whether you're starting from scratch or revamping your SEO, it's helpful to take an inventory of current SEO rankings for important keywords. As you do your research, store it in a spreadsheet. To inventory, you’ll want to take stock of two different sets of metrics: what keywords are currently bringing people to your site and what keywords you should add to the mix. Tools such as SEM Rush or Moz will help you determine what keywords are currently attracting site visitors. Google Adwords and HubSpot SEO will provide a snapshot of the searches related to your field or business that are most popular, and how difficult it will be rank in those search terms. Documenting both sets in a spreadsheet will make tracking them easier as you publish content. Now that you have a sense of what keywords your site has and what you need, it’s time to get creative. Brainstorm new long-tail keywords, including full questions your buyer personas might type into a search engine. Think about what problems or challenges your business is looking to solve for your ideal personas and formulate questions around those problems or challenges. Don’t be afraid to get specific: The more precise you are, the better your chances of ranking high in search results and beating out the competition. Again, tools such as Google Adwords and HubSpot SEO will provide you with data like monthly searches and ranking difficulty. Scope out the competition and determine how difficult it will be to break into the first page of results. With HubSpot, in particular, you’ll be able to track competitors for how well they’re ranking for the keywords you're targeting. Just as your field and your ideal personas’ habits change over time, SEO trends, patterns and tools keep evolving. Keyword research isn’t a one-time activity, and keywords are something you’ll want to track closely over time to keep your content fresh and relevant. While your knowledge of your customers is always needed for SEO, you don't necessarily have to do it all yourself. A good marketing firm can carry out SEO to help your customers find both your new content and what you've published in the past.